Often as I drive through the mountains of Northern Virginia I am impressed at how completely shrouded in mist and a Civil War remembrance they can be. At times entire mountains are invisible. These are the mountains favored by Colonel John S. Mosby during the Civil War. He and his band, Mosby's Ghosts, AKA Mosby's Raiders, AKA Mosby's Rangers, would use the mists of these mountains to hide and in the early morning hours swoop in and perform whatever his orders were to do. Perhaps one of the greatest guerrilla warfare tacticians ever, his raids would be accomplished on horseback, and Mosby's Ghosts would ride in swiftly and suddenly. Mosby's Raiders were lightning fast, and departed from the theretofore cavalry war techniques in that they used revolvers instead of sabers. This Midnight Raid had made Mosby totally famous, very feared, and the target of Union retribution. By 1864 the Civil War in Virginia had become a changed conflict, a war of attrition, and the North regarded civilians and their homes to be fair targets. 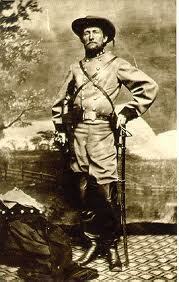 Union generals were also tired of Mosby and his band, and Grant decided to seek them out for destruction. He was even ordered to find the families of Mosby's men, capture them and keep them prisoner at Fort McHenry in Baltimore. Riding with 36,000 men General Philip H. Sheridan left Harper's Ferry to advance on what they called "Mosby's Confederacy." Their orders were not only to search and destroy, but to particularly seek out and eliminate Mosby and his men as much as possible. Grant had ordered Sheridan to "Put himself south of the enemy and follow him to the death." Grant wanted Sheridan to meet Mosby as Mosby was always seen, on horseback, and to rely more on cavalry than infantry, telling him, "Let your headquarters be in the saddle." Sheridan was to "eat out Virginia clear and clean as far as they [soldiers] go, so that crows flying over it for the balance of the season will have to carry their provender with them." Not in the orders, but communicated by telegraph, was another chilling order by General Grant: "When any of Mosby's men are caught, hang them without trial." In the early morning hours of August 13, a wagon train separated from, but supporting, Sheridan's army was resting on a side road near Berryville VA. Sheridan's movement included many wagons full of food and supplies. Suddenly, out of the mists of the mountain nearby, came a small group of men, setting up two small cannon. The Union troops of the wagon train thought them to be friendlies, and paid them little attention. Suddenly the cannon fired, destroying many wagons. Mosby's Ghosts then came rumbling out of the mist, their horses heavy and loud, whooping and hollering. They attacked with ferocity. Some of the wagons burst into flames and the frightened horses attached to them fled, dragging the wagons behind them like roaring torches. The wagon train squad was taken completely by surprise and fled in panic. A local woman watched as the Northern troops "hid behind the burning ruins, they crouched in the corners of fences, they begged for life, but their day of grace was past." Over in minutes, Mosby's victorious men had captured over 200 prisoners, 700 horses and mules, 200 cattle, and 100 supply wagons. This kind of raid was typical, and Mosby was serving notice that General Phil Sheridan had best be on guard while invading Mosby's "personal" territory. This incident began a back and forth of viciousness and destruction that the locals referred to as "The Burning." It continued until the end of the war. The Union left much civilian destruction and death in its wake, all over Northern Virginia. The Union had so much trouble getting supplies to Sheridan's front that one colonel estimated 500 cavalry would be needed to adequately protect a supply train. Union troops, and particularly cavalry, so feared Mosby's Ghosts that some of the more battle hardened said they would rather charge into a hand-to-hand battle than patrol the misty, valley roads of Northern Virginia. As I was driving in the morning hours along a rural, side road near Berryville VA, the mist was so thick I did not realize how close I was to the mountain side. It was completely enveloped and shrouded in mist. Not long after, the mists began to disappear. I wondered if I was not near the scene described above! When here it is easy to see how Colonel Mosby could use these mountains and their mists as hiding places to conduct his guerrilla warfare, and pick apart the Union troops and movements where ever he could.